Here is Paolo wishing me “Happy Mother’s Day!” during breakfast. I got lots of big, gooey, slobbery kisses first thing yesterday morning. We had a good day; it was very relaxing. We tried to go for a walk downtown, but it was so cold (I know, it’s crazy.) that we ducked into the Olde Main Pub, in honor of my maiden name, for lunch. There I enjoyed a spicy Blood Mary; I don’t think I’ve had one in years! Then we had a leisurely day at home. For dinner, Giuseppe grilled steaks, which was divine. The day was just lovely. It really is incredible how much our lives have slowed down since we’ve moved to the Midwest. 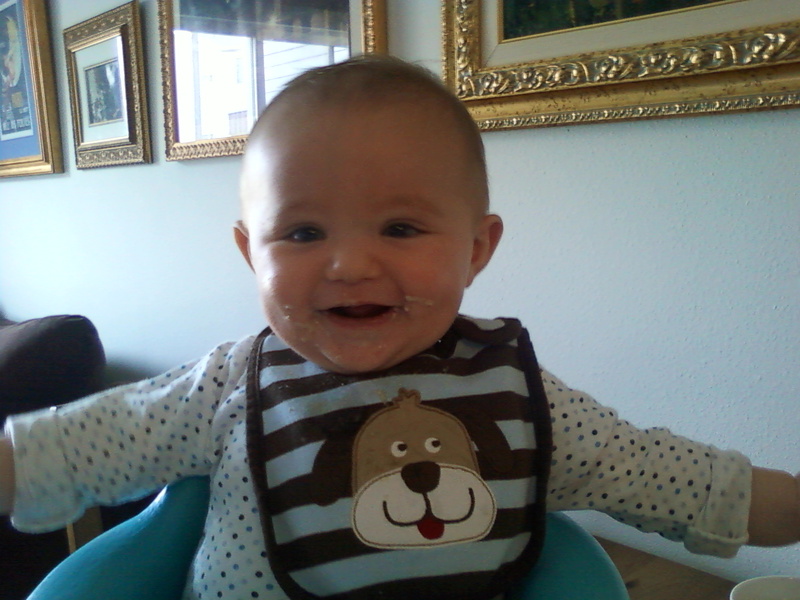 He is such a happy baby! And I am sure that depends on the fact that he receives so much love! Look at him, ready to hug his mummy! Always smiley! Bello Paolino, cresce forte e sano! Sounds like a wonderful day! Mmm, spicy bloody mary, like it’s own meal! He is so sweet, just wait till he is calling you mommy and wanting to give you “squeeze” hugs.